Tax season is a great time to set up triggered emails that are sent out when fintech customers take certain actions, or fail to do so, such as providing documents for filing their tax returns. Triggered emails can also be scheduled to go out on certain dates tied to major tax season events. In fact, triggered emails have 8 times better open rates and drive more revenue than regular bulk emails, according to Experian. They’re a great example of sending the right message to the right person at the right time, and tax season’s looming April 15 deadline is the perfect date to work backward from when planning triggered email campaigns. Here are 4 strategies you can use with your triggered tax season emails. You want to grow sales every year, and acquiring new customers is a valid part of achieving that goal, but the people who have used your service in years past should factor into your marketing strategy too. You can’t assume they’ll return this year, so you should schedule a triggered email that goes out at an opportune time to catch their interest. 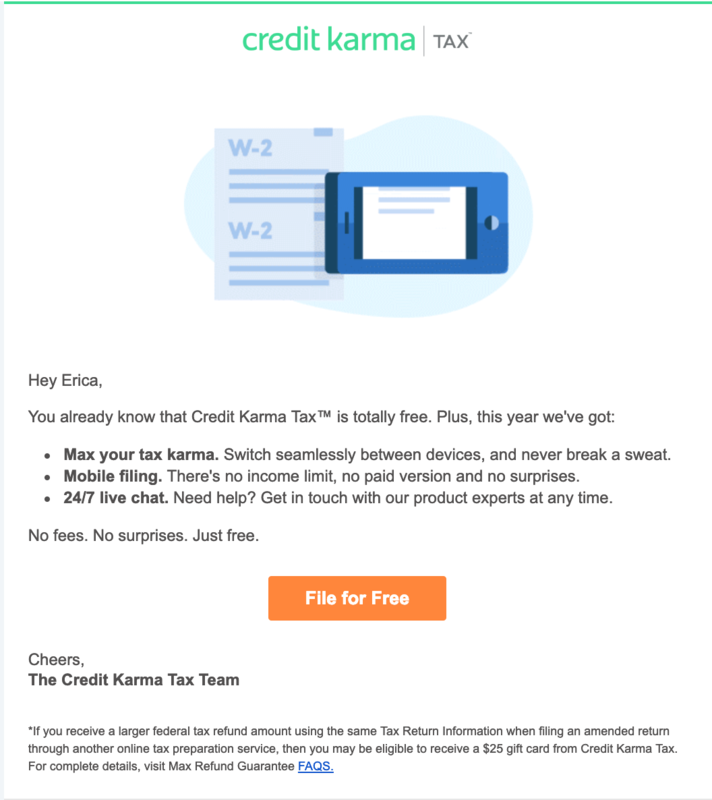 This email from Credit Karma was sent in early January, a time when people are likely thinking about doing their taxes but possibly haven’t decided who will take care of that task for them this year. “Welcome back” is used in the subject line and in the email body to remind the recipient of their past relationship with the company, and the “100% free plus our Accurate Calculations Guarantee” value prop is the main message here, with the goal of enticing the client to click the Learn more button. Note the use of the recipient’s name in the email body. According to Experian, personalized emails deliver 6X higher transaction rates. Despite modern technology making it easier to electronically file tax returns and have refunds sent straight to bank accounts, plenty of people still put off what needs to be done. Set up a deadline-themed triggered email that will go out a specific number of days before April 15 to get the attention of procrastinators. It doesn’t hurt to also get in touch with non-responders after the deadline and let them know that it’s better to file late than never. Add increased urgency to your messaging so they know that penalties are accruing with each day that passes. This Credit Karma email sent on March 1 does a good job of upping the urgency a little without pushing too hard, since the recipient still had roughly six weeks to file. The use of the person’s first name helps cement the connection, which is smart since people are 26% more likely to open emails with personalized subject lines, according to Campaign Monitor. 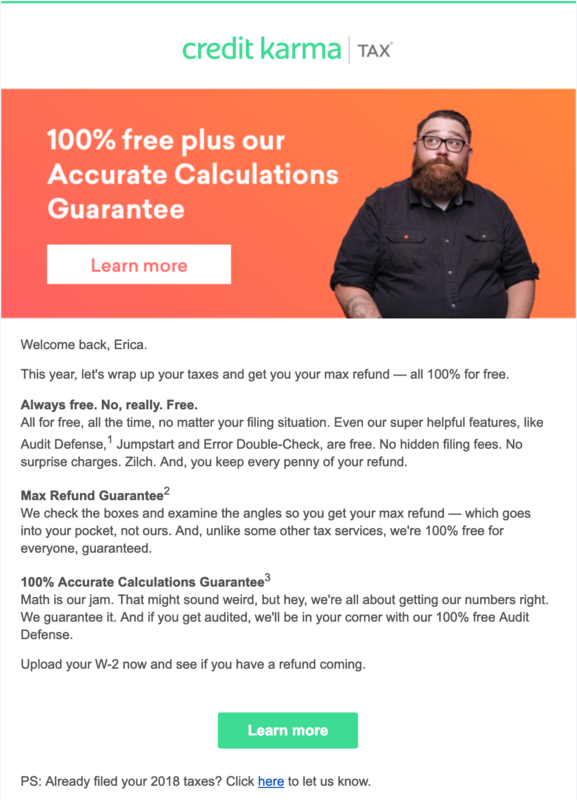 The three value prop bullet points add some enticement to the message, and the GIF of someone snapping a shot of their W2 with a smartphone helps drive home how easy it is to file a tax return with Credit Karma. People like to receive emails that acknowledge certain actions, such as an order being shipped. In the financial technology industry, you can keep customers happy by setting up triggered emails that let them know you’ve received their paperwork, their tax return is ready, their return has been filed, and so forth. Those confirmations also help reduce support costs, since financial transactions typically cause anxiety that can lead to “What’s happening?” emails and phone calls if customers feel like they’re in the dark. A short, friendly email is usually enough. And keep upsells and cross-sells out of the message, since people don’t typically like to be asked to spend more money when they’re trying to find out if their sensitive documents have been received. This email from Intuit uses a trigger based on the availability of the customer’s W2. They not only came up with a catchy, hashtagged name for their promotional email (#W2sDay), but they let the user know that all they have to do is sign in and Intuit will pull in last year’s information. The progress bar complements the “You’ve got a head start” messaging to make it clear that all they have to do is click the Go button to get a jump on this year’s filing. The customer quotes give the recipient an additional nudge to click through and get started. Campaign Monitor has noted that segmented email campaigns can drive a 760% increase in revenue. They’re one of many companies whose solutions enable email marketers to segment their customer lists by demographic information, purchase history, and other attributes. For example, you can segment your list by the types of tax returns your customers file: a simple 1040; a 1040 with a Schedule C for business income; a corporate tax return; and so forth. Then you can send a different email to each group, also known as a cohort, and acknowledge what kind of return they filed last year. You can also customize the list of documents they need to provide to get this year’s return completed. Apply that segmentation to your triggered emails to create a series of messages tied to different kinds of tax returns. Doing so also lets you include relevant tips, such as best practices for organizing business receipts, that can drive additional engagement. Customers like knowing that a company they’ve done business with isn’t just sending them generic, one-size-fits-all emails. Check out these four examples of fintech companies that have made their apps and websites pleasurable to use while adhering to the law. Discover how to ensure that your business' transactional and marketing email messages are aligned to deliver a great customer experience. Learn about five different digital trends that the most innovative financial services businesses are using today to differentiate themselves.